The Northampton Arts Council is proud to announce the 2017 Northampton Biennial. This is the second Northampton Biennial to include both poetry and visual arts. Our opening celebration will take place in conjunction with Arts Night Out at Hosmer Gallery, Forbes Library on Friday, October 13th, 5:00 p.m. to 8:00 p.m. The event is free and open to the public. 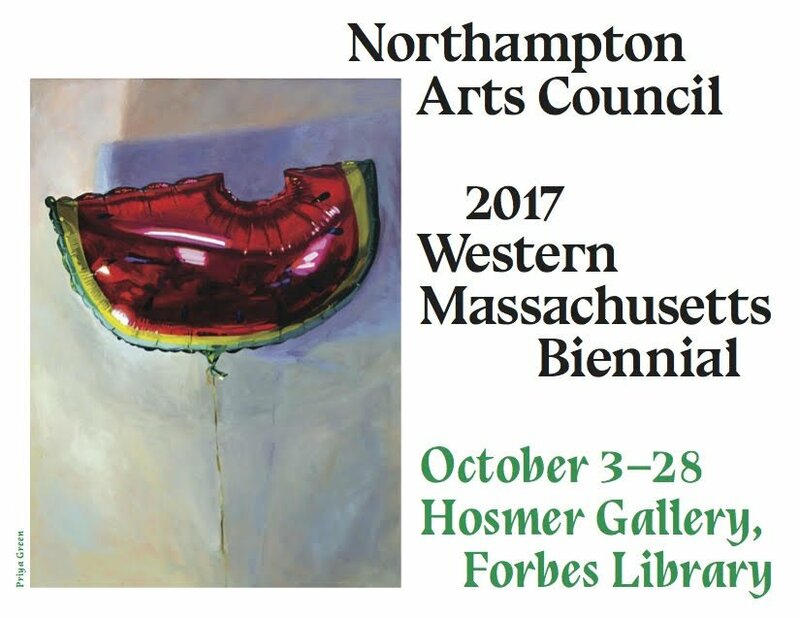 For the 2017 Biennial, the Northampton Arts Council asked artists and writers who live and work in Western Massachusetts to submit their best work created in the past two years which most closely represents their personal artistic vision. The visual art for the Biennial Exhibition was selected by three jurors: Rosemary Tracy Woods from Art for Soul Gallery in Springfield, Justin Kimball, photographer and faculty member at Amherst College, and H. Emerson Blake, Editor-in-Chief at Orion Magazine. The jurors selected work in a wide variety of styles and media from 32 artists, including painting, printmaking, book arts, photography, video, and sculpture. Their selections reflect their shared interest in experimentation, innovative use of materials, and an open-ended approach to narrative. The poetry, which will be presented at a reading and in a publication, was selected by three jurors: Northampton’s poet laureate Amy Dryansky; Diana Babineau Owen, Managing Editor at Orion Magazine; and Robbie Dunning, poet. The Biennial Poetry Reading will be held on Monday, October 23rd at 7:00 p.m. in the Calvin Coolidge room at Forbes Library. Accepted poems will be available at our opening reception as well. The Northampton Arts Council has partnered with The ArtSalon to present a special Biennial ArtSalon on Sunday, October 15 at 6:30 p.m. at STUDIO4, 25 Main Street, Northampton. Six artists represented in the 2017 Northampton Biennial will each present their work in the engaging Pecha Kucha style of 20 slides x 20 seconds each. Brayton’s abstract sculpture will be installed on Forbes Library lawn.